3 Reasons Why Word of Mouth Marketing is Essential! Here’s why Word of Mouth Marketing is an absolute must for your business! If you’re looking to create a thriving business, it should come as no surprise that word of mouth referrals are going to be just a teeeeeensy bit important for driving new custom. In fact, we’ll go one step further. They are THE most important way of driving custom. Don’t believe us? Check out these three stats and prepare to be thoroughly convinced! 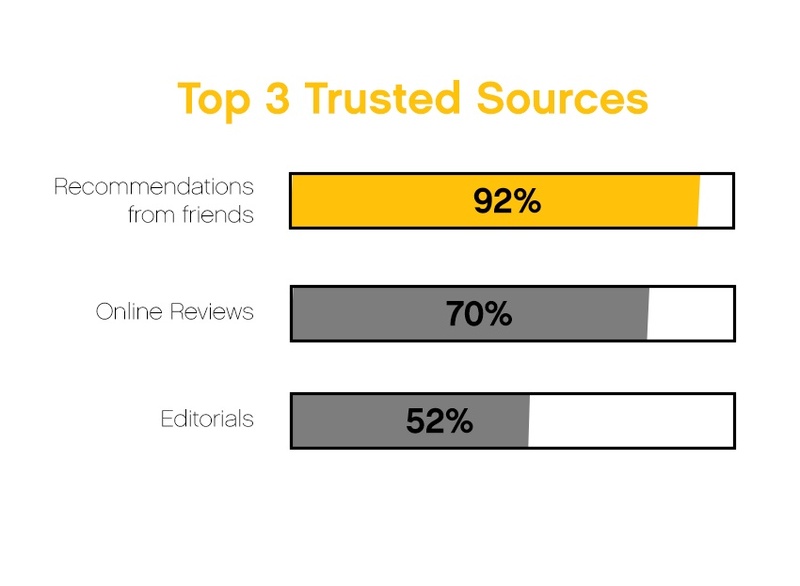 Trust is the lifeblood of a business and if a personal recommendation comes through from a friend or family member, that’s not just a positive review, it’s a referral. Driving these recommendations will make your business a verified destination rather than somewhere to take a punt and hope for the best. When you look at the above stats then this is really a no brainer. Traditonal advertising is all well and good for creating brand familiarity but this takes time and important resources. All it takes is a few simple, honest comments in a review or recommendations and this can result in a conversion for FREE. Not only will it drive your sale but it will have an uplifting effect on all of your other marketing avenues! According to The Drum, 15% of the marketing effectiveness of paid advertising‚ comes as a result of people talking about it or sharing it on social media. And the ROI is easy to prove: on average, £1 spent on WOM will result in £3.93 in sales, according to research we did with ESCP Europe. If you haven’t looked into WOMM yet, you’re missing out more than you’ll know. Thankfully, there’s no time like the present. At GroHawk, we’ve made it our mission for SMEs to help drive word of mouth referrals for their businesses. Try us for FREE and start generating conversations about your business.